The word Alpenglühn (“alpenglow”) denotes a reddish light on the summits of snow-covered mountain peaks at sunset or sunrise. A golden glow covering the mountaintops and valleys, bringing to mind scenes from the popular animated series “Heidi, Girl of the Alps.” Alpenglühn is also the name of a specialty optical store on Rüdenplatz square in Zurich, where the carefully chosen mix of products on the shelves adds its own kind of luster. 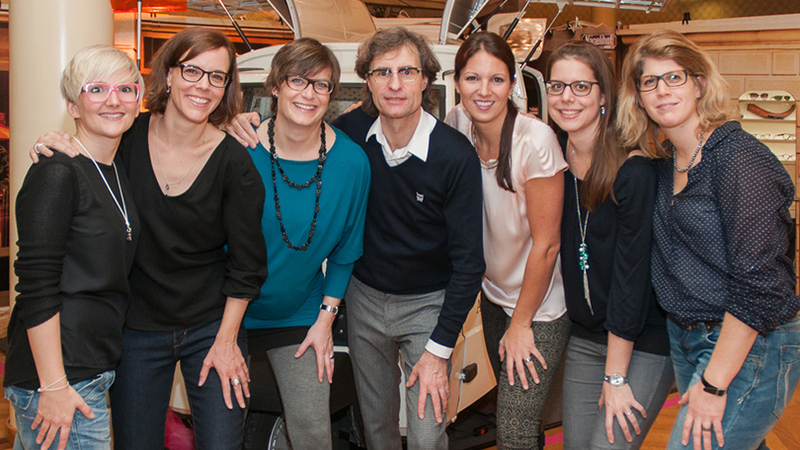 This is actually our second profile of a Swiss optical store in a row. Last issue, we visited the picturesque town of Bern, while this time we’re headed to cosmopolitan Zurich; a city known for bridging the gap between a laid-back historical atmosphere and the amenities of a globally connected metropolis. 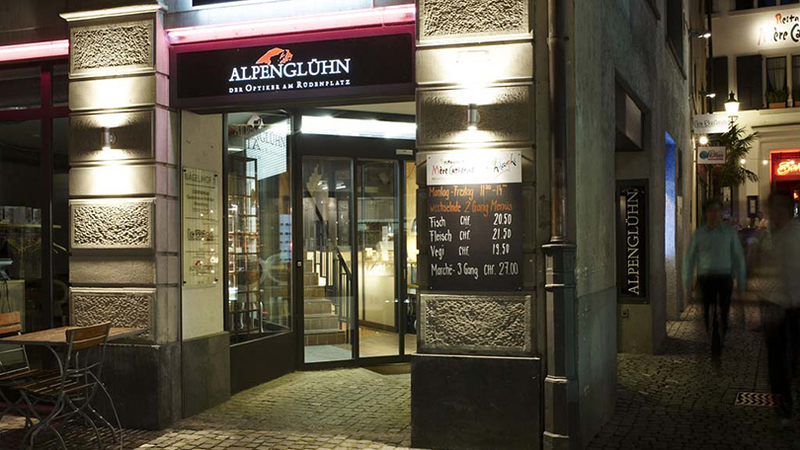 The Alpenglühn store can be found in the old town right across from St. Peter church, with its tower known for having the largest clock dial in all of Europe. Inside, the store led by Kai Müller and Markus Moser offers a striking selection embedded in unique interior design. We spoke to Kai Müller about keeping the passion glowing after almost 20 years in the business. Hello Kai, how can you even get any work done in Zurich with all the activities, the mountains and the lake right on your doorstep to distract you? I’m one of those privileged people who perceive their work not as work, but as a passion. I really enjoy working at Alpenglühn and it really enriches my daily life. The beautiful surroundings are 100% inspiring to me and I am grateful to be working in such a place. What led you into the eyewear business? It was this drive to leave school at age 16 and to find a job in a new environment working with adults. I did not want to work at an office, so a handicraft would be nice – but which one? Right at the time, we had a family friend over for a visit who was an optician, and he really made the job sound attractive. After two internships it was a done deal for me and I went to look for an apprenticeship. How did you end up owning a specialty optical shop? My business partner and I studied optometry together at the University of Applied Sciences in Olten. During this time we had pretty intense discussions about what the ideal optical store would look like. We wanted to somehow create a professional future for ourselves that was different from what was offered at the time. So about seven months after graduating we went out to search for a suitable location and after some setbacks we discovered our current retail space here in the heart of Zurich. Next to the amazing location, what’s the special charm of Alpenglühn? The reason for your name instantly becomes clear upon setting foot into the store. But what came first? Your name, or the golden glowing wall? Optical retail is not your only venture. You’ve branched out into running your own distribution agency. What was the motivation? We never planned on becoming a distribution agency. We already had our hands full setting up our shop and building a customer base. Unfortunately, some of the existing “top dogs” in our city’s eyewear retail scene blocked our access to some popular brands we were familiar with, so our launch line-up of brands was rather small. This made us look for alternative ways of sourcing and during our search for exciting products we made lots of interesting connections. At the New York tradeshow, Markus discovered a small, foldable clip which he brought back to the store. At the time, sun clips were a huge hit and I was really into the product. And since the company had no representation in Switzerland, we ordered lots of these clips to sell to our network of friends. Then we asked the company whether we could get the import rights for Switzerland and they became our first product. A while later, we added the first frames collection and later also the metal plate glasses made by three original characters in Berlin. Because of these glasses we had to start the Alpenglühn Handels company, which now employs five people. Do you and your partner deal with both aspects or is there a clear division of responsibilities? Naturally, we exchange ideas on the regular. But we like to run both segments independent of one another. This way, everyone has a chance to identify with their work more. Yes, that’s definitely true. At least from my perspective. There’s a kind of familiarity that helps us arrive at a mutual understanding and have complete trust in your partner. It also helps us to never lose our true focus, even when there’s a large disagreement. And we’re always keeping an open mind for sound advice. You are in charge of the store in Zurich. It’s pretty safe to say that the town is rather rich. What are some of the challenges for an optician in such a city? I can only speak for myself. The customers are very demanding and they want to be able to feel your authenticity, honesty and passion. We recently met you at the Paris tradeshow. What attracts you to these events – the “meet & greet” aspect or inspiration for new products? Pretty much both. I still get a sense of curiosity when I visit trade shows. But I also know from experience that real surprises are actually quite rare. That’s why the “meet & greet” aspect is just as important these days and really makes every trade show visit a pleasant experience. Did you find some new labels for your line-up? Are there some groundbreaking new brands, must-have items for 2014? I’m pretty reserved when it comes to giving advice. I think everyone should know for themselves what they want to show their customers. But I really liked glasses by Suzy Glam. And wooden glasses by ROLF were once again technically refined, brilliant. Since I’m looking for small companies with an authentic presentation, my approach was pretty selective, so I didn’t have the time to look at many vendors in detail. Our “must-haves” are Reiz, Hervé Domar, ic! berlin, Retrospecs, Bevel, Lunor, l.a. Eyeworks, Blac, Ursprung and natural horn glasses. What’s the idea behind this selection of brands? All of these brands have their own signature style and work in a very professional and dedicated manner. This is reflected in their quality, delivery capabilities, consistency and their price-performance ratio. Have you ever tried your hand at eyewear design? I design glasses at regular intervals, which Dieter Wollenweber or Pascal Nüesch implement for me in natural horn. I’m currently working on a new model which we’ll showcase at Blickfang design trade show in Zurich. Most of the time, these are ideas I’ve had on my mind for a long time. It’s at a pretty manageable scale, so I’m still really familiar with each model even years later. We attract customers who are looking for – and are able to appreciate – a great product in a personal atmosphere. And in many cases they are people who have to meet high standards in their workplace. And how do you make sure that these customers will return to your store for their next eyewear purchase? Our customer service is proactive, competent and friendly. We provide our customers with an outstanding product that will give them joy on a daily basis for a long time. Here and there we also invite customers to one of our events. Aside from events, how do you communicate with your customers? More the old-school “catalogue and birthday card” approach or the complete social media gambit?! Neither one. I don’t have the time and motivation to go all out on social media, and I really can’t stand birthday cards. The most intense communication you can have is during product counseling, handing over the glasses and during follow-up service. We’ll send customers their info via text message or email. And we use postcards to send invites to our events, while we make small booklets for Blickfang trade show. What’s the most beautiful aspect of your work? My personal interactions with diverse and interesting people as well as selling high-quality products. What are some key areas independent opticians need to master in order to remain competitive against large retail chains? You have to have a great interest in your market segment in order to be able to respond quickly and flexibly to changes on the market. For me it’s clearly about being an all-round talent, someone who has an idea about psychology, business economics, craftsmanship, customer empathy, sales, design and the tools of the trade. Let’s assume Kai Müller has converted to Hinduism. What do you expect to be doing in your next life? As a strategically thinking person I already spend all my days trying to live in the present moment, not tomorrow or the day after tomorrow. So I’m really not interested at all in what will come in the next life. For me it’s already enough to know that it’ll happen! Yes, that is already something. Great seeing you!